“Physicians and patients may now have a fast, safe and well-tolerated treatment option to consider before prescribing even more antihistamines, which can be highly sedating,” says Sarbjit (Romi) Saini, M.D., a Johns Hopkins allergist and immunologist, and study co-investigator. The research team’s findings are scheduled to be published in The New England Journal of Medicine online Feb. 24, to coincide with their initial presentation at the annual meeting of the American Academy of Allergy, Asthma & Immunology in San Antonio, Texas. “Patients suffering with this condition need more and better treatment options because chronic hives and rash are profoundly hard to treat and can be very debilitating,” says Saini, an associate professor at the Johns Hopkins University School of Medicine. Saini, who has studied omalizumab since 2005, points out that fewer than half of those treated respond to traditional drug treatments with antihistamines. 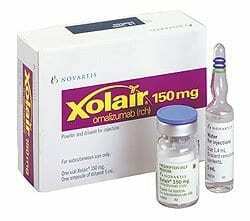 In the study, the team of American and European researchers injected a 300-milligram dose of the drug, sold under the brand name Xolair, once a month for three months. Saini says initial relief from symptoms was quick and occurred after a week. After three months, 53 percent of people experienced a total elimination of all hives and 44 percent had no further incidents of hives or itch. Lower doses of the drug, at 150 milligrams and 75 milligrams, and the placebo (or 0 milligrams) proved half as effective as the next larger dose, or had almost no effect at all, researchers say.